As a new parent I can be honest in saying that I didn’t quite understand the weight or meaning of such a statement. I couldn’t picture our “village” extending much beyond our direct family, that is until now. Since Lauren’s diagnosis we have been blessed with an outpouring of support, love and care towards our family. Our village has extended significantly, it not only includes friends and family but extends to our church community and then goes even father to include strangers from all over who have learned of Lauren and have cared enough to help. We are often approached by kind strangers who let us know that they are praying for Lauren and our family. Some like Jenn Munro have even taken the initiative to fundraise on our behalf! A week ago we launched our Lavender bracelet campaign to help raise funds to care for Lauren and raise awareness about Krabbe disease and our website. The response was more than moving, we were blown away by how Lauren’s story has touched so many. One of the challenges we face on a daily basis is finding ways to engage Lauren as her cognitive and physical abilities continue to deteriorate. 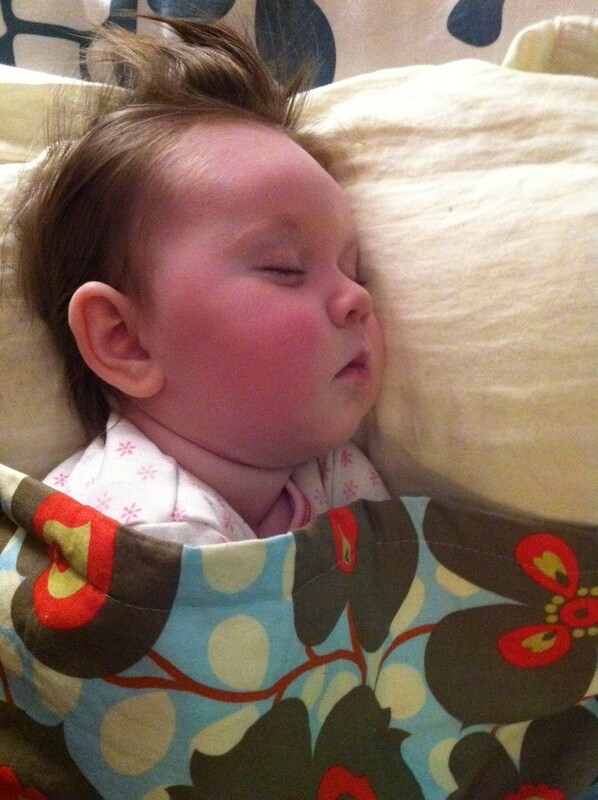 Although she may seem distant and sleepy at times we can still tell when Lauren is happy and enjoying her environment. Unfortunately, it has become more and more difficult to stimulate Lauren using regular toys and equipment due to her limitations. Thanks to the donations many of you have made we will be able to purchase some specialty equipment to stimulate and improve the quality of Lauren’s life. In addition, this money will help offset the cost of therapies that we hope will help alleviate some of Lauren’s pain. As parents we try to do everything we can to enrich our children’s lives and make them happy. In the last few months we have struggled to reconcile our desire to enrich Lauren’s life with the reality of her limitations. The support shown over the past week has lifted our spirits and more importantly given us the opportunity to do much more to enrich Lauren’s life and make her happy. We are sincerely grateful for your generosity and continued support and prayers. We will keep you up-to-date on the care made possible through your generosity. 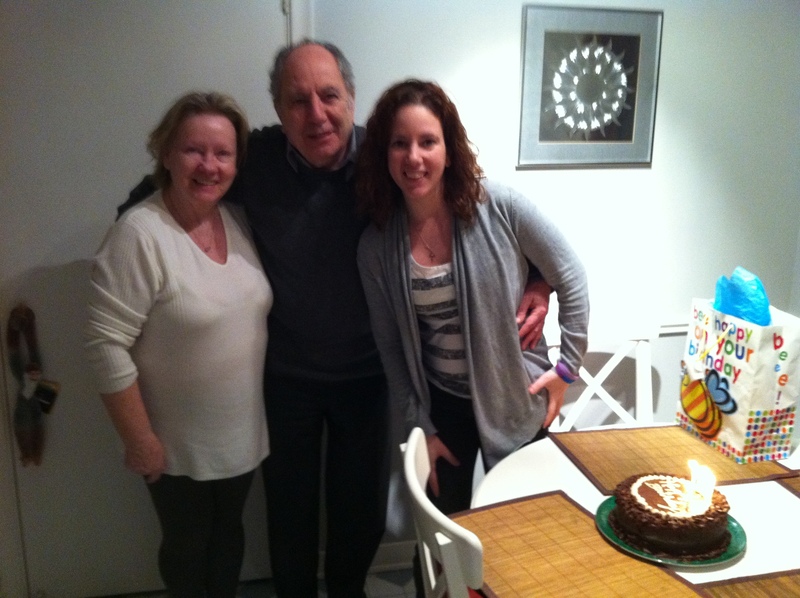 It was Lauren's Grandpa Birthday on the 23rd, HAPPY BIRTHDAY DAD! The tears flowed freely today – Maybe it was because I was tired or it was just my emotions catching up with me, either way I couldn’t help it. 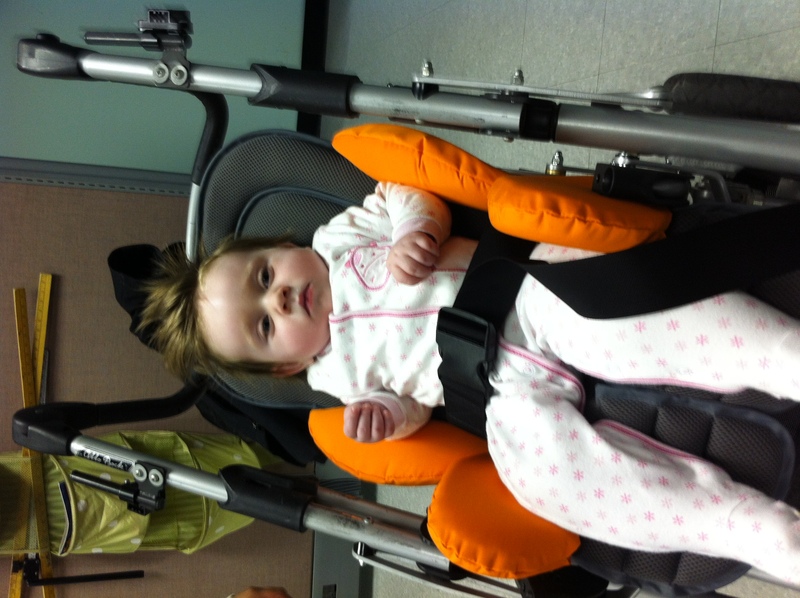 It began this morning when we took Lauren to the rehab centre to try out an adaptive car seat. The rehab centre is also a school for children with disabilities and upon arrival we were met with hallways that were brimming with beautiful children who were enjoying their recess. Our appointment with the seating department was located on the floor below, making our way to the elevator I could hear children laughing and playing together. Once downstairs the children playing above sounded like a rainstorm, full of activity, it was then that I broke down. My heart ached for Lauren, I wished that she too could have the opportunity to laugh with friends, play and learn. Later that afternoon we went to the hospital for an EEG to check if Lauren had been suffering from seizures. The appointment went well, although we don’t yet know the results. In meeting with our doctor to go over Lauren’s medication doses, I cried again. Medicating for pain is a tricky balancing act, too much and we could prematurely lose a smile or small giggle, too little would cause suffering. 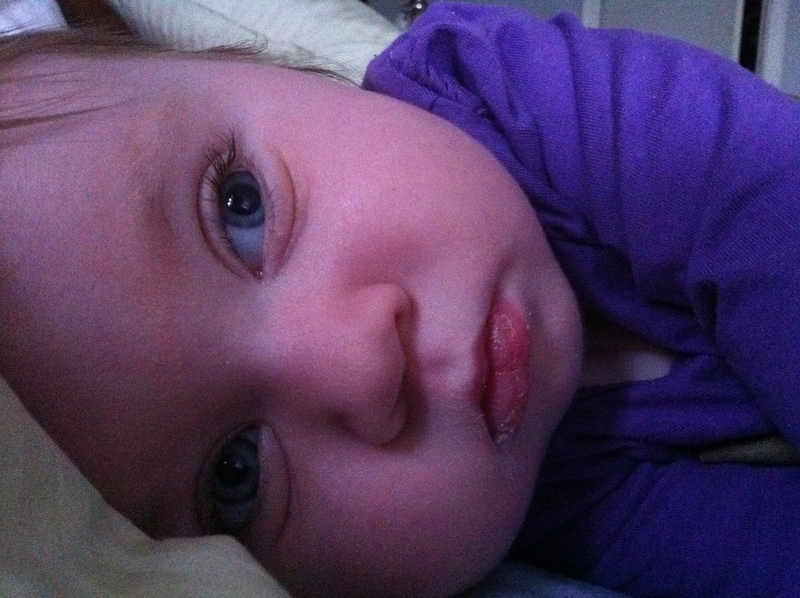 The reality of Lauren’s disease tore at me, once again I knew that there was very little that I could do for our baby. 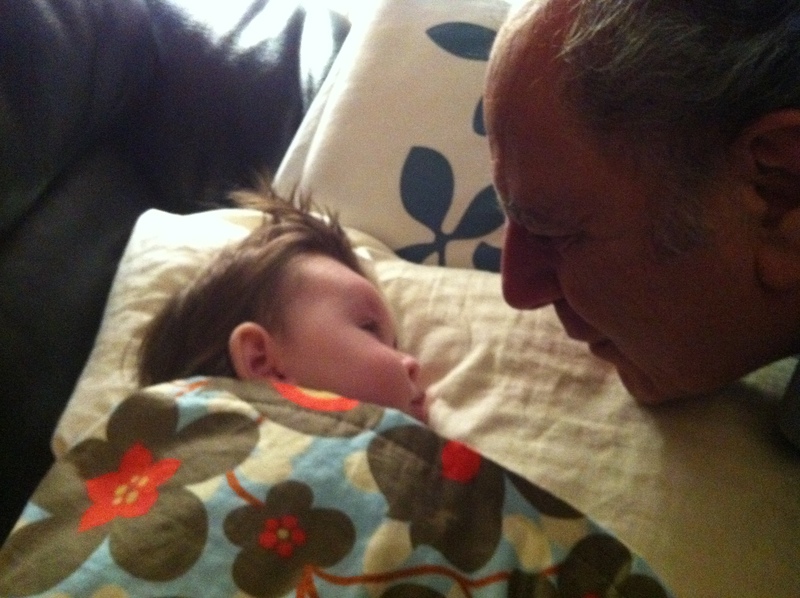 At home I can ignore reality, focusing on the moment at hand so as not to see the greater picture – the reality that we are losing our little girl. Reality is harsh, Lauren has already lost so much, and yet there is still more losses to come. I pray for more time, time is precious and in life there are no guarantees that we will be given more. Lauren has opened my eyes to this. I wanted to share some short video clips with you of Lauren before and after Krabbe disease stole her ability to laugh and smile. This is how I still see my daughter everyday. (They are not edited and I apologize for the quality). You can find more on Youtube by searching lifewithlol, I’m hoping to add more as time goes on. 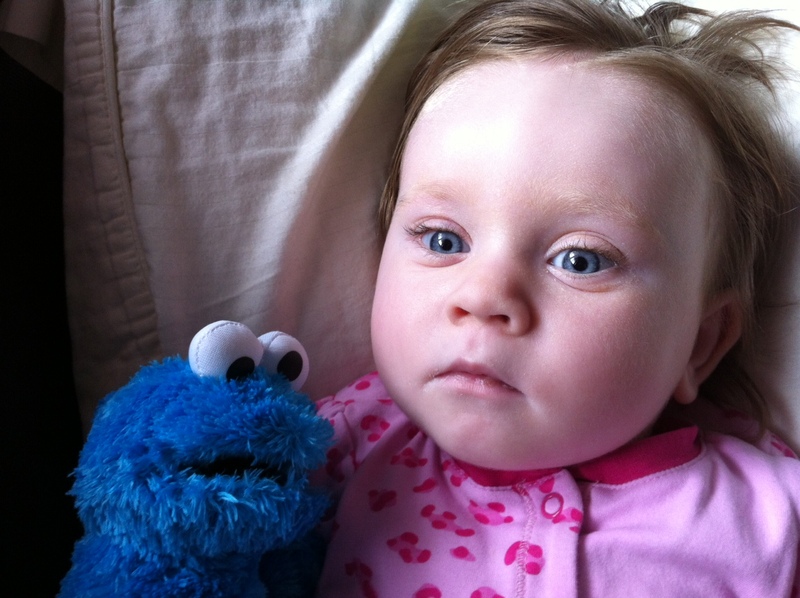 August 2011 – Lauren is Seven months old and laughing up a storm! The next video was taken this weekend during Lauren’s Nonna’s visit. Thank you to everyone who has been praying and thinking about our Lauren, sending much love to you and your families. This week was difficult to start, Lauren was feeling more pain than in days previous and was unable to enjoy the things that she likes best – being held and dancing around with mommy. Adding to the stress of Lauren’s pain issues we received a tasteless letter from the Quebec SAAQ on Monday denying our request for a handicap parking permit. Instead of advising us that they would need more information they wrote, “We are unable to process your request. At this point in time, the child’s limitations due to his (her) young age may be mistaken for inabilities.” I couldn’t believe that someone reviewing our file could write something so insensitive, I mean did they really think that we applied for a handicap permit just because our one year old can’t walk! After a day or so of being angry I just decided to focus on building a better case and send them a note from our doctor accompanied by a (highly edited) note from myself requesting that they take a second look. The good news is that the week did improve as it went on. Valentines day was nice and relaxing, Lauren gave us many kisses and Stephen surprised me with beautiful roses and one of the most touching cards, we ordered in from an italian restaurant and enjoyed our time together in the family room. 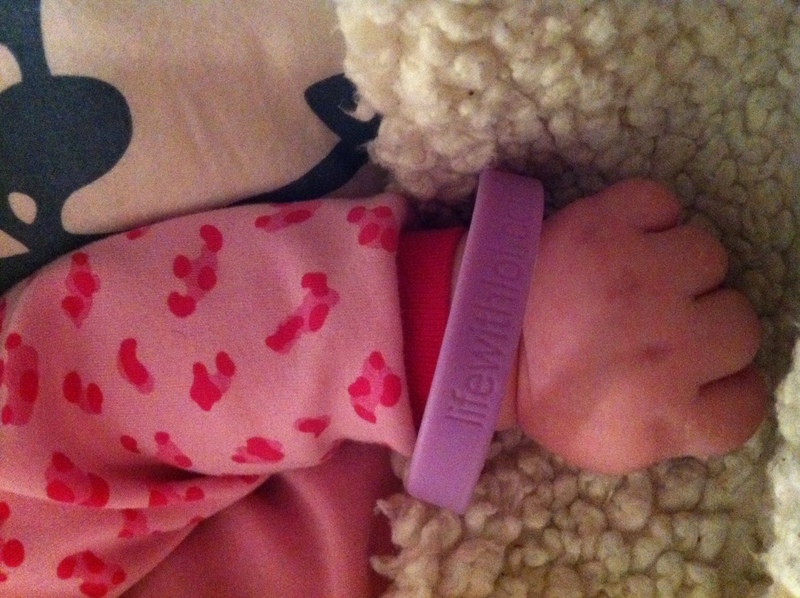 On Wednesday, we received a very exciting package in the mail, Lauren’s lavender bracelets! We ordered these bracelets to help us to raise money for Lauren’s care (stuff that insurance can’t cover) and to raise awareness about Lauren and her journey with Krabbe disease. On a side note, If you would like to get your hands on one of Lauren’s ultra fashionable bracelets you can click on How to Help in the menu or just click here. 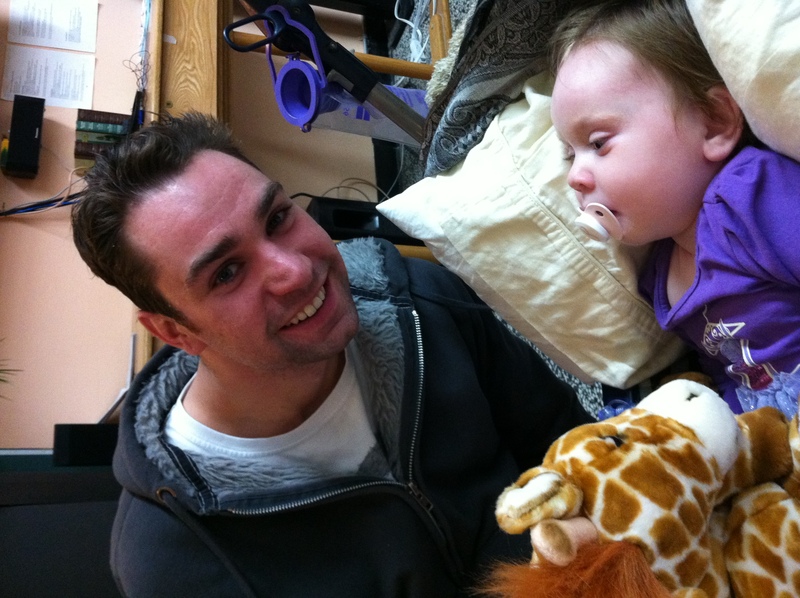 Thursday, we headed to the Montreal children’s hospital to see Lauren’s Neurologist. The appointment went well and we were able to get Lauren on a new medication – Indocin, an anti-inflammatory. From my understanding this medication can help lessen some of Lauren’s symptoms by alleviating the inflammation in her brain. It’s a little too early to tell if the medication is helping, Lauren does seem a bit more alert but she still screams when we try to move her. We will be going back to the hospital on Tuesday for an EEG so we will be monitoring her pain levels until then, I’m hoping that we wont have to increase her pain killers just yet. On Friday Lauren’s Nonna arrived from Belleville, and with her came goodies for Lauren! Jenn Munro (check out her blog post about Lauren here) had captured some beautiful images of Lauren in January, and with the help of her fans raised money for some gorgeous canvases and a donation. Along with the canvases came a cute blanket by Dezignz by Liz and decorative pom poms from Pom Tree. She even inspired a musician named Emelie Mover to raise money and dedicate a show to Lauren, how very cool is that! At this point you may be wondering about the title of this blog, well I figured why not save one of my favourite moments of the week for last! On Valentines day Stephen and I started a memory jar, it’s an idea that I came across on Pinterest and fell in love. 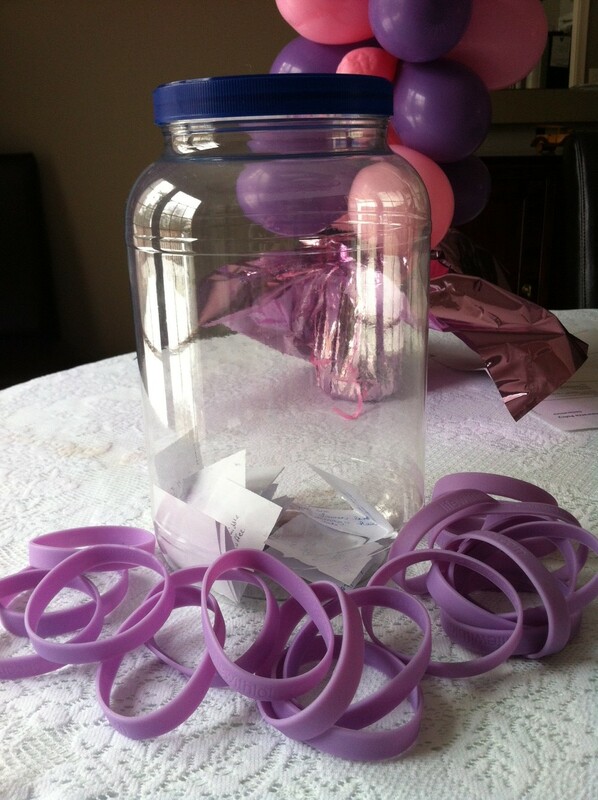 A memory jar is basically a place where you store memories that you jot down before forgetting. The fun part about it is that it doesn’t take much time, and can be added to at any time using any piece of available paper. So many fun things happen in our lives and sometimes we forget, with the memory jar it’s easy to find a scrap piece of paper to record those fun memories. Another great feature is that unlike a journal or diary anyone can take part in adding memories to the jar, family and friends alike are welcome! The memory jar has also been a great tool for helping me to focus on the good things that are happening around us at a time when it can be so easy to drown in the bad. Today is a happy one – we woke up to a beautiful winter day, a fresh dusting of snow filled the little circle leading up to our house, waiting for us to mark it with our tracks. 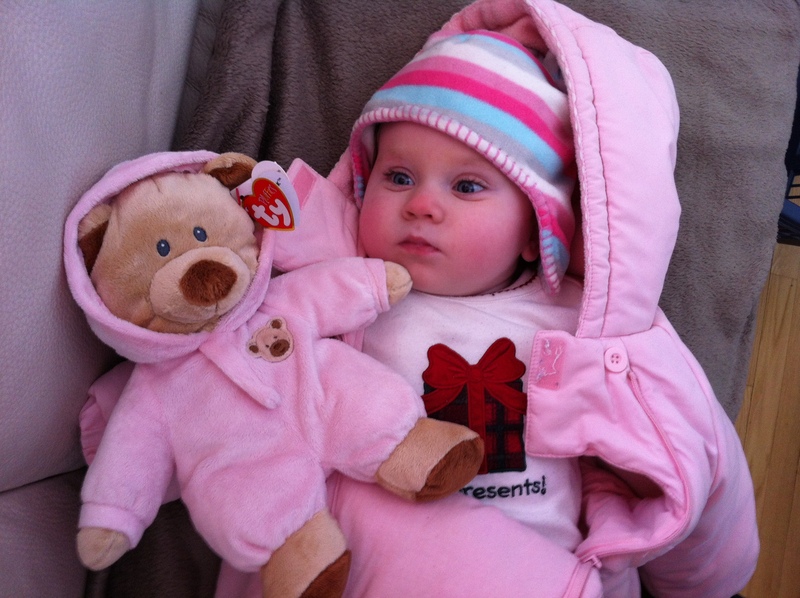 After drinking our morning coffee and reading to Lauren, Stephen prepared her sled and packed her into her snowsuit. Soon after, we were off to explore our neighborhood. The streets were quiet and the sun joined us on our walk from its spot behind the clouds. Lauren loves sledding, she lies there bundled up watching me walk next to her while daddy pulls her ahead, she looks peaceful. It’s amazing how a child can remind you how beautiful the world is. Lauren has this ability to bring me back to my childhood, aiding me to see how the smell and sights of winter can be wonderful. More than ever I’ve been noticing the beauty of the world around me, I often find myself looking out our windows at the trees and birds in our backyard. The shimmering sun off the icy snow can be really beautiful. Sometimes it’s this beauty that brings me sadness, I’m sad that Lauren’s time on this world is limited and that she wont get the chance to really experience the world like another child her age. This past week has been a mostly positive one for our family. Lauren’s recent increase in Baclofen (a muscle relaxant) seems to have helped in making her more comfortable. She still has moments where she is clearly in pain but thankfully they are short-lived. I’ve been noticing that she is a lot gassier this week than usual, I’ve had to make sure that I vent her stomach after every meal to help her. Poor baby! Have you ever had bad cramps from eating the wrong thing (that may have seemed so right at the time 😉 ) imagine living with those cramps every day and not being able to properly work it out on your own. This week I spent a lot of time dancing with Lauren around the house, our favourite show is the Much Music Countdown. Her and I love to spin around the family room to all of the new videos. Lauren makes the cutest faces when she dance, and sometimes she even lets out a coo letting me know that she is happy. On Wednesday the cutest thing happened, Lauren Laughed. I was dancing around the family room with her and Stephen was washing dishes in the kitchen. It was such a fun moment that Lauren and I wanted to include daddy, so we danced right up to him at the sink, upon which he let out a happy “Peek a boo”. Lauren loved this and let out s very small giggle – of course this led to us repeating it over and over to see if we could keep it going. She only laughed once or twice more, but it was obvious that she was thrilled. Thursday was dinner night at Grandma and Grandpa’s house. Lauren had a really fun time watching TV in Grandma’s arms, having discussions at length with Grandpa, and getting many kisses from her big brother Oscar. 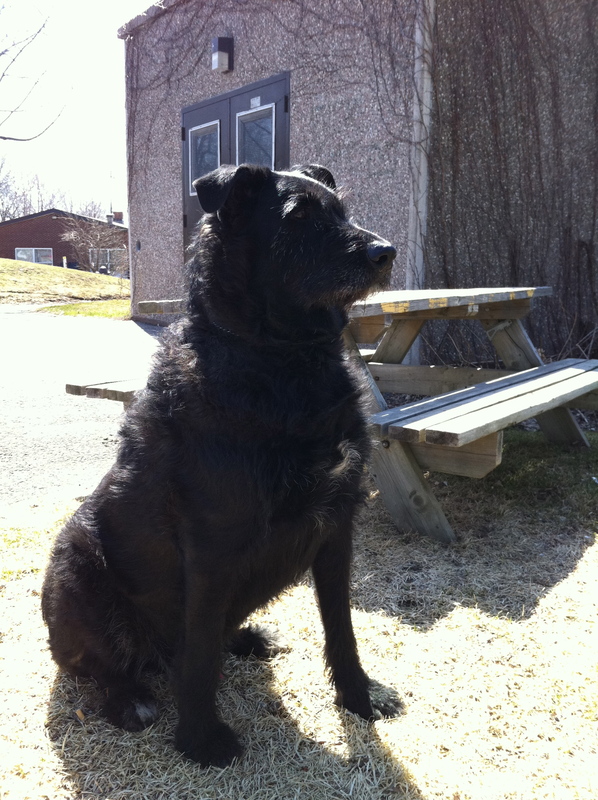 Oscar is our dog, he has been staying with my parents since Lauren’s diagnosis. He’s a good boy around family but can seem a bit aggressive with strangers, and considering the fact that he weighs 120lb we decided that it might not be the best to have him at home when lots of people had been stopping by to check in on Lauren. Additionally the weather has been so cold, and with Lauren hating her stroller I couldn’t give him all the walks that he needs. I’m looking forward to bringing him home when the weather gets nicer, in the meantime he’s in very good hands. 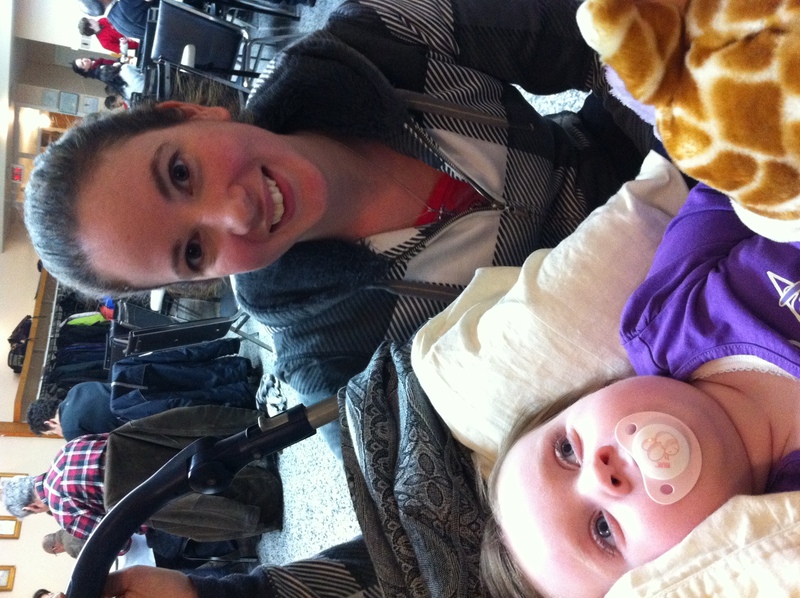 On Friday we all went to the Mackay Rehab Centre to get Lauren fitted for an adaptive stroller (i.e. child wheelchair). It was a great experience, we felt like we were in good hands and are really excited to get the new equipment for Lauren. I even cried a little when they mentioned that they were going to order us a device that would allow us to snap the chair section out onto a roller in the house. The device has a lift so Lauren can join us comfortably at the table! This also means that I will have more freedom as I can move her around the house with me. This is HUGE! Leaving Lauren on her own for even a minute or so at a time scares me, she has had a few instances where she has started to choke on her saliva so leaving her alone for any space of time can be a worry. 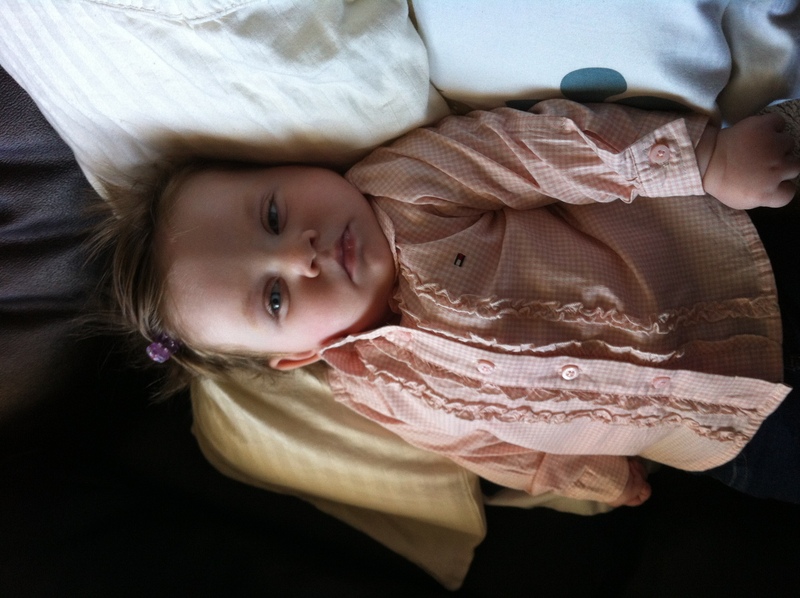 Lauren wearing her new Tommy Blouse, Thank you Alex! Twins! Lauren and Teddy in Matching outfits. Thanks Nikhil and Rina!